May 26, 2010  President Obama's visit Wednesday to a solar cell factory in California is part of a broader push to promote alternative forms of energy. 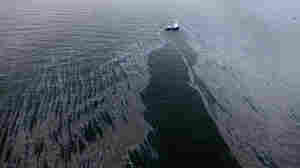 But in the wake of the massive Gulf oil spill, some observers say Obama is missing an opportunity for even stronger action. May 24, 2010  The battle over whether to allow gays and lesbians to serve openly in the military is expected to come to a head on Capitol Hill this week. The Obama administration has endorsed a proposal that would eventually allow gays and lesbians to serve openly in the military. May 22, 2010  A congressional committee this week echoed the White House's own findings that the intelligence community failed to connect the dots in a way that could have prevented Abdul Farouk Abdulmutallab from boarding a plane on Christmas Day 2009. Both the facts and the politics meant someone had to go, and this week it was National Intelligence Director Dennis Blair. May 5, 2010  More than two weeks have passed since an oil rig exploded in the Gulf of Mexico, killing 11 people and touching off a major environmental disaster. The story, which began far from land, now stretches along the Gulf Coast and all the way to Washington. Here, a detailed look at the crisis as it unfolded. May 3, 2010  President Obama traveled to Louisiana Sunday to assure coastal residents that the government is doing all it can to control the oil spill in the Gulf of Mexico. He had little good news to offer, though. Oil continues to flow out of control from a wellhead nearly a mile below the surface of the Gulf, and Obama warned it could keep flowing for a long time. May 1, 2010  Getting the 15 million first-time voters who supported Barack Obama in 2008 to return to the polls in November is a major focus of the party's $50 million midterm mobilization. But relying on people who haven't voted reliably in the past could be a risky strategy. April 28, 2010  A new bipartisan commission has begun its search for ways to dig the federal government out of its deep budget hole. President Obama told the 18-member bipartisan National Commission on Fiscal Responsibility that all options are on the table. He ordered the commission to study the debt problem, after the Senate refused to set up a similar panel that might have actually forced action by the government. April 24, 2010  Older Americans are just as skeptical of Washington as the rest of the population is, but their trust of the Social Security Administration remains strong. Many doubt the government's ability to offer similar security to their children. April 23, 2010  President Obama on Friday renewed his call for a "comprehensive" overhaul of the nation's immigration laws and criticized an Arizona bill signed into law today that requires police to question people suspected of being in the country illegally. April 22, 2010  President Obama made his pitch for rewriting financial rules Thursday in the nation's financial capital. He told an audience in lower Manhattan that without new curbs on reckless financial behavior, the U.S. is at risk of another economic meltdown. April 22, 2010  Obama will push Wall Street to get behind the effort to write new rules for the financial industry. Although the measure enjoys broad public support, so far no Republican senator has been willing to back it. April 20, 2010  The Treasury secretary told the House Financial Services Committee that ripple effects from the 2008 collapse of Lehman Brothers demonstrate the problems with a lack of regulation of big firms. April 16, 2010  President Obama sketched out a vision for the future of manned space travel during a visit to the Kennedy Space Center Thursday. His plan was closely watched in the politically important state of Florida. The president said his plan will keep Americans traveling into deep space, with an eventual goal of Mars. April 14, 2010  President Obama addressed the heads of state from 47 nations, and won promises of cooperation in denying terrorists access to nuclear materials Tuesday. The president also used the two-day nuclear security summit to pursue an array of other foreign policy goals, including sanctions against Iran and a floating valuation for the Chinese currency.